Bandipur is a beautiful old Newari town situated high on a hill off the road between Kathmandu and Pokhara.The town was established as a funnelling point of trade by Newar traders from Bhaktapur in The Kathmandu Valley after it had been conquered in 1768 by the king at the time Prithvi Narayan Sha. Bhandipur grew as an important stopover along the India Tibet trade route.With them they brought their cultural heritage and architecture which basically has remained unchanged to this day. Originally a simple Magar village in the early 19th. Century Bandipur developed into prosperous trading centre and a community with town-like features: substantial buildings, with their neoclassical façades and shuttered windows and streets paved with slabs of silverish slate. Bandipur today has developed over the last few years into a favourite stop over for tourists who are often on their way from Kathmandu to Pokhara. It is a fascinating place and still unspoilt there are also some fantastic panoramic views of the Himalayas from here. 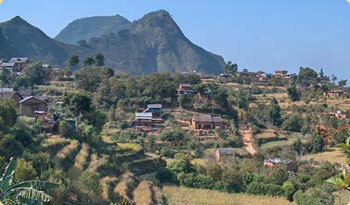 The treks listed below center around the Bandipur region and commence from Bandipur. Day 02: From here start the trek gently on the bank of Seti river for initial part to reach a small stream for about one hour. From here the trail starts climbing up through mixed forests and villages along. Most part of the trail is gradual uphill walk which approximately takes 4-5 hours to reach Dubung. This is Min Thapa’s village, which is really rich in its own culture & tradition and gifted by nature. Overnight at tented camp at Bhalethunge danda from where the majestic views of mountains, landscape, hills, villages can be observed. Day 04: Exploration day in Dubung village. Morning Hike to Sasarki Thumka from where views of Terai and also the stunning views of Annapurna, Dhaulagiri, Manaslu, Gorkha and others Himalayan ranges can be enjoyed. Exploration around Dubung village during the day; See the lifestyle of the local people with their day to day life. Visit historic throne of the Thapa King at Bhalethunge danda. When Nepal was divided into many kingdoms, Dubung and surrounding area also used to be a small kingdom under the rule of Thapa King. Day 06: After the morning tea and breakfast, trek gently descends downhill to Sudhepul. Continue trek or take a jeep to Damauli. Drive to Pokhara or Kathmandu. Transfer to Hotel.